This article is about the village near Fordingbridge. For the location near Winchester, see Hyde Abbey. 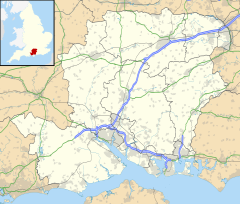 Hyde is a village and civil parish in the New Forest near Fordingbridge in Hampshire, England. The parish of Hyde is mostly within the boundary of the New Forest National Park. It includes the hamlets of Blissford, Frogham, Furze Hill, Hungerford, North Gorley, Ogdens, and Stuckton, as well as tracts of New Forest heathland centred on the Latchmore Brook to the east. The parish has 383 occupied houses, an infant/junior school, a village hall, and two pubs. Historically Hyde was a hamlet belonging to the parish of Fordingbridge. The ecclesiastical parish of Hyde was formed in 1855 from part of the parish of Fordingbridge. The church of the Holy Ascension was built in 1855, and is of red brick with stone dressings and consists of chancel, nave, north vestry, south porch and western turret containing two bells. The village of Hyde remained in the civil parish of Fordingbridge, although from 1868 lands to the east of the village were part of a parish called Ashley Walk, which lasted until 1932 when Ashley Walk was incorporated into an enlarged Fordingbridge parish. The civil parish of Hyde was created in 1979. The former Admiral of the Fleet, Peter Hill-Norton, lived in Hyde in his retirement. ^ "2001 Census Neighbourhood Statistics - Civil Parishes in the New Forest". www.neighbourhood.statistics.gov.uk. Retrieved 2011-07-08. ^ and NorthGorley/LeadKeyFigures.do?a=7&b=11124951&c=Hyde&d=16&e=62&g=6431082&i=1001x1003x1032x1004&o=362&m=0&r=1&s=1481367679601&enc=1 "Civil Parish population 2011" Check |url= value (help). Neighbourhood Statistics. Office for National Statistics. Retrieved 10 December 2016. This page was last edited on 2 April 2017, at 12:54 (UTC).